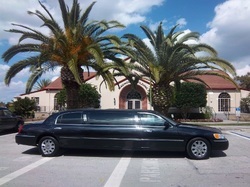 The Lincoln Corporate Limousine seats 4 to 6 passengers, and is a perfect fit for limousine rental in Lakeland, FL for corporate clients, executive retreats, Airport pick-up, executive dinners, corporate luncheons, and more! If you have an important business meeting and want to make a truly powerful impact, pick your client up in this Lincoln and you are sure to grow your sales numbers! For Lakeland limousine rentals, you cannot do better than this executive, luxury limo, and you can book this today at a price that will work for your business's budget.